As part of our Healthy School program we now offer the children a self service salad bar in the dining room. This is available every day and is in addition to the vegetables and fruit on offer with the normal school meals. There will be books available for children of all ages and abilities, and a leaflet is enclosed giving an indication of titles available. If you are unable to visit at opening times but would like to purchase a book, please complete the order form on the leaflet OR use the form below. Payment must be sent in with the order and all cheques should be made payable to ‘Framlingham Sir Robert Hitcham’s CEVAP School’. World Book Day Ltd has issued £1.00 book tokens to each child in the school. They can be redeemed at any bookshop participating in the promotion and are valid from Monday 3 March to Sunday 30 March 2008 and are enclosed with this letter. 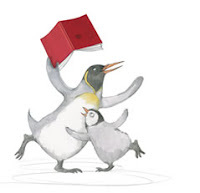 They can also be used as part purchase for a book worth £2 or more from the Travelling Book Company, or as part purchase for a book from the Scholastic leaflet to be issued to Key Stage 2 children with this letter. From Monday 3 March until Sunday 11 May vouchers will be available from Tesco stores for every £10 spent. The school will collecting these once again, and the box will be by the School Office. Please find attached a copy of the school homework policy, for your information. 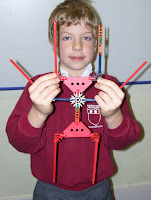 K’nex club is for Year 2 children in the Autumn term and Year 1 children in the Spring term. Next Friday our school football team is back in action with a cup match against Thorndon. It is a home game. 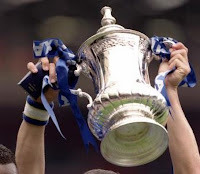 Kick off at 3.30pm. We have been informed by Thomas Mills High School that there have been two police reports of a male (approx 30 years old, 5’7”) trying to persuade young people to get into his car. Please can you and your children be vigilant and report anything suspicious to the police. Children should avoid being out alone after dark. On Friday 29 February we are holding a Mother’s Day Service at St Michael’s. 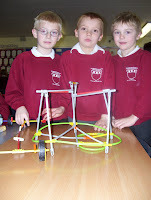 KS1 and Foundation will be at 9.30-10.30am, and KS2 at 10.30-11.30am. Parents are welcome to attend this event at the Church where they will be invited to sit with their child and join in with the activities. There will be a limit of 2 adults per child. To help us with numbers, please complete the attached slip and return to the office by Monday 25 February. On Tuesday 4 March our Year 5 children will join other Year 5 pupils from our Pyramid of Schools for an evening singing concert at Thomas Mills High School. 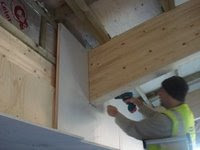 The ‘Share our Work’ sessions have proved popular over the last couple of years. We would like to invite parents into the classrooms at the end of the school day where their children will show them their trays and discuss their work with you. The teachers will be available for general help and advice but it is not intended that this be an opportunity to discuss your child’s progress with their teacher in detail. If you wish to make an appointment for another time, please speak with the teacher. If you have more than one child in the school, you may wish to visit each class with the other siblings so that you can enjoy looking at each other’s tray together. The Nursery children will not be taking part in this. We look forward to seeing you at this event, which we think will be most enjoyable. Could we ask bus parents to please make it quite clear to their children if they are to travel home on the bus or not on this day? There will be no Maypole or Holy Horrors on this day. We have many girls’ excellent quality school summer dresses for sale in all sizes. They will be available outside the School Office on Wednesday 5 March (Share our Work Day) until Friday 7 March. They can be purchased for a donation to the school. We will gladly receive any dresses that are found to be too small this year – come and do a swap! Other uniform is also available. To celebrate World Book Day the children can come to school dressed as their favourite book character. 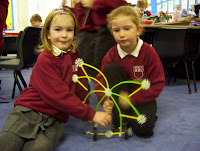 Lessons and playtime will continue as normal, so costumes and footwear still need to be practical for a day at school. We would really like to hear from any parents willing to come in to help mount the children’s work for the many displays we put up in classrooms and around the school. One of our TAs would train you to give you the skills needed. We are looking for volunteers from 2-3pm on Tuesdays and Wednesdays and/or 3-4pm on Thursdays. Please contact the office if you would like to help. Thank you. We have understandably had a complaint from the residents of Coucy Close who are concerned over the continued use of their road as a car park at school drop off and collection times. It appears that there have been a number of instances of driveways and access to properties being blocked by inconsiderate or illegal parking. Please can we remind parents not to park where it would inconvenience residents of Coucy Close. Thank you. To reduce the repeated occurrences of Head Lice across the school, please can we ask parents to regularly check for the presence of the lice and eggs, and treat them (not just when you get a class letter about it). For advice on ways to treat head lice, please see the leaflet on the parent notice board and we have some copies at the office. 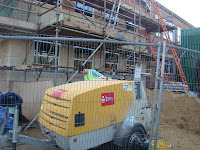 During half term the scaffolding was taken down. 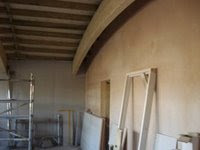 We can now see the completed view of the new building joined onto the existing structure. The builders have been creating a path alongside the new building. On the inside there has been plenty of activity by decorators and electricians. The school chess team have been playing regular matches this term against other schools. These images are from a match against Norwich School - much older boys. A High Suffolk Primary Schools basketball tournament was held on Friday at Debenham High School. 10 schools were divided into 2 leagues. Robert Hitcham's started well but struggled to turn dominant possession into points. We were pleased to win 8-4 against Eye and 2-0 against Stradbroke. However, in the next pair of group matches Hitcham's played some excellent basketball. We beat Laxfield 16-2 with Ewan, Danny and Oliver playing particularly well. In our last group match we really started to score freely with a 28-2 win against Wickham Market. Jen and Phobe had good games and both scored highly. Robert Hitcham's were clear winners of their group. In the semi final we played the runner up from the other group: Stonham Aspall. Hitcham's stuggled to play their fluent style against strong and tall opponents. Jen was unable to get in any shots due to close marking from a taller male opponent and we lost by 10-2. Stonham went on to win the final against Eye. The event was great fun and despite only a couple of practices we did much better than expected. At lunchtime Mrs Colchester runs a board games club. It also includes traditional card and dice games. Nearly 40 boys and girls from years 5 & 6 have been playing touch rugby after school every Tuesday this term (in all weathers). As you can see in some of the pictures we are very lucky to have the stunning backdrop (to our sports field) of the 11th century Framlingham Castle. Mr Brook's literacy group have been writing letters of complaint and protest. We have read an article about child labour in Asia and looked at how we might protest about the situation. Please watch this short film to see how bad the conditions are for many children in Bangladesh. 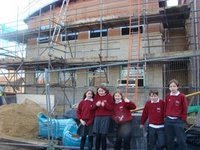 The children in our lunchtime computer club have been following the progress of the new building. They have been using the weekly photos to make their own films. This has been done using 'MovieMaker'. The finished movie is then saved as a media file for broadband use. This film is by Michael Class GM (Year 6). The outside of the building is now almost complete. 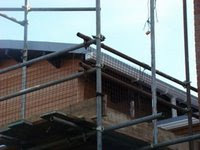 The guttering has been fitted. All the work is now taking place inside the building. 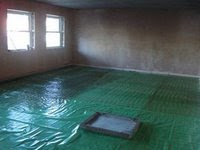 The walls are being plastered and the floors cemented. Some of the Tuesday computer club members (who have been making a film about the building) were allowed a sneak preview inside one of the new classrooms. · PAYMENT WILL ONLY BE ACCEPTED ON A MONDAY. · We are asking that parents decide and pay for the number of lunches their child would like at the beginning of each week. · We prefer you to specify which days (but you can just state how many). · You can still pay for the half term in advance on the first day (eg 3 days for 5 weeks = 15 meals). · If you do not pay for dinners on a Monday, YOU MUST PROVIDE PACKED LUNCH FOR YOUR CHILD EACH DAY. · If your child forgets a packed lunch we will ring you to ask you to bring it in. We are advising you of these changes half a term early to enable you to get used to the process over the next few weeks, before we fully enforce the new system after Easter. SCHOOL DINNER MENUS can be seen in the classrooms, on the Parent Notice board or on the School Website http://www.hitchams.suffolk.sch.uk click on ‘School Dinner Menu’ in the BLOG box, or click on 'School Dinners' in the Archive Area below and follow the link. Next week is half-term and the children return to school on Monday 18 February. The mid-year reports about your children will be out this week. These reports are confidential and are addressed to you as parents, please advise your children not to open the reports. Could I please remind parents that children are only allowed fruit, dried fruit or vegetables for snack-time. Processed fruit (eg Fruit Flakes, School Bars, yoghurt raisins etc) should be kept for the lunchbox. For parents of Year 6 pupils, the Year 6 camp will be from Monday 7 – Friday 11 July 2008. Further details will follow shortly after half-term. From Thursday 14 February until Wednesday 4 June vouchers will be available from Sainsbury stores for every £10 spent. The school will collecting these once again in the box by the School Office. ‘5 A-DAY’ campaign, the aim of the menu is to encourage children to eat more fruit and vegetables. In our school hall we currently have a picture gallery featuring 2 pieces of work from every class in Robert Hitcham's. This covers Nursery up to Year 6 so there is a huge variety of work. To see the full collection please watch the video below - you need to wait about 20-30 seconds for 'buffering'. 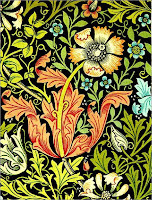 It is also worth looking at the blog entries for the William Morris study by years 3 and 4 plus the portrait work by Class DB. 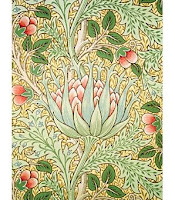 Classes CA and NF have been studying the artist William Morris. 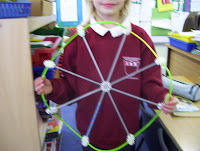 They looked carefully at his pictures and recreated his work themselves. What do the pictures remind you of? Here are some examples of William Morris pictures and some of the children's work. Click on the pictures for full size versions. Watch the movie below for a gallery of all the children's pictures. You need to wait about 30 seconds for the video to 'buffer'.